For those of you local to North Texas (or within reasonable driving distance), come see us at the Scrapbook Expo in Grapevine today and tomorrow. Susan will be doing a make ‘n take there today and I will be doing one tomorrow. We hope to see you there! We know you love fast shipping (so do we!) and we are working hard to get all your orders out the door just as quickly as we can. The main image panel is cut from the rounded rectangle die in the DOCUMENTED Confetti Cuts die set and then stamped with the horizontal stripes from the SO STRIPEY stamp set and a sentiment from the LOVE BLOOMS stamp set. I layered the flowers with green linen thread and a gold and black flag ended panel cut from the TAG ME Confetti Cuts die set. Before added the main image panel to the card base, I flicked (instead of sprayed) gold color mist onto the base of the card. I can’t wait to make more of these. 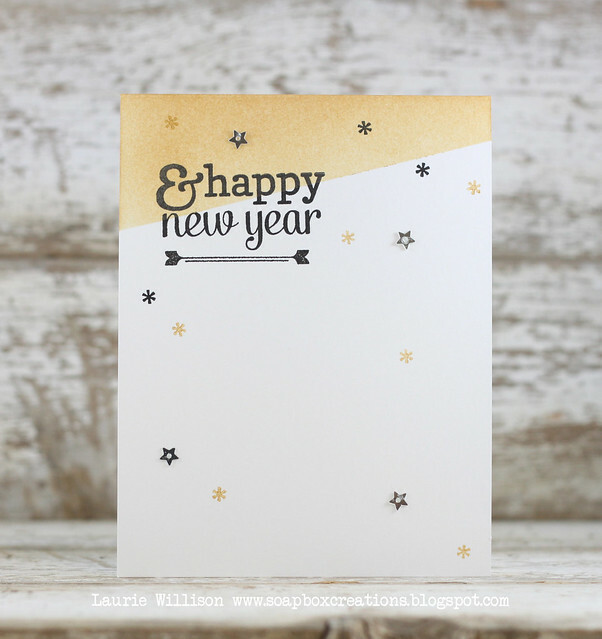 So easy and fun and they really give this otherwise simple card quite the wow factor! Usually we post the new SKETCH FOR YOU TO TRY on the 1st of each month, but since we were participating in the SEASON’S GIVINGS HOP yesterday, we bumped it to today. This is a great sketch and I hope that you will play along for a chance to win a $20 gift certificate! The Confetti Crew has come up with some great inspiration using this sketch! Now it’s your turn! Show us your SFYTT! Today I have a super fun WEDNESDAY IN THE WORKS post for you! Reverse Confetti is the sponsor for the new sketch over on StampNation…how fun is that?!? Catherine (of CatherinePooler.com/StampNation) and I have collaborated on a few things in the past, but I have to admit that has been by favorite so far! Today, you’ll see cards from not only the Confetti Crew, but also from the talented StampNation Design Team HERE. Not a member yet? Today’s the last day for the $1 trial (sweet!). You can get that HERE. It’s a wonderful community of stampers and there is always something new and fun to learn and see! 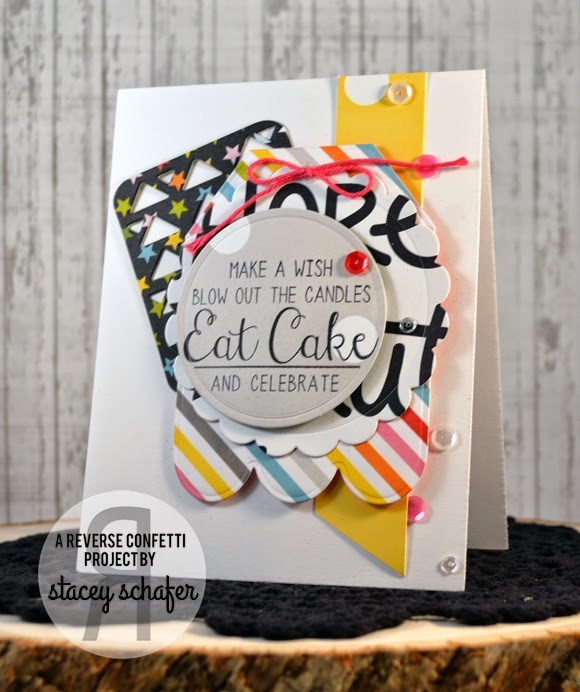 Catherine is also up today here on the Reverse Confetti blog with her take on the sketch with some of your favorite Reverse Confetti products! I told you today was special and fun! Thank you so much to Jen for having me as a guest designer today and for hosting the challenge at StampNation this week! We have been blown away at the creativity from both Design Teams, but I really shouldn’t have been too surprised! When you are using RC stamps, great things happen! I got to play with Fresh & Fruity and have made FOUR cards with the set. The oranges on this card were Rock and Rolled to create depth and dimension and I couldn’t resist adding Frosted Lace Stickles to the oranges…now they are almost good enough to eat! I hope you enjoy the video – be sure to watch until the end for a little surprise. Check out my blog tomorrow, too for another fun card with this set and an out-of-the-box way to use it. After we dropped him off, my hubby and I headed to IKEA to pick up the last piece of my office transformation. Once that piece is built, I will be sharing pics. Stay tuned! We have another great Confetti Camera here for you today! “Hi there! Today I am sharing a scrapbook layout that I made using Fabulous Flamingo, So Stripey & the Class Act Confetti Cuts. I started with some Webster’s Pages patterned paper to scrapbook this photo of my daughter and I. I was inspired by the Fabulous Flamingo sentiment: “what makes you different makes you beautiful” and wanted to use it for the title of my page. However, I decided to change the last word to “amazing” & to spell it out on my layout using chipboard letters. For the sentiment, I die cut some patterned paper using the rounded edge rectangle die from Class Act Confetti Cuts and masked the sentiment so as to not stamp “beautiful”. Then I tucked this behind my photo and added a super sweet coordinating charm. I cut my patterned paper into a 3″ square and stamped a So Stripey stamp in this fun purple colour. For my flamingo, I stamped the head & body in the same purple, but stamped it off once first, before stamping it onto the patterned paper. Then I stamped the legs and beak in sweet blush. I finished it off by stamping “beautiful” from the same Fabulous Flamingo sentiment. I am ready for this weekend to begin…are you? This weekend a few girls from the Confetti Crew are making their way down to Houston for CKC! Reverse Confetti will be doing Make ‘n Takes at The Little Blue House booth #500. If you are planning to be at the event, be sure to stop by and give us a big hug! I always get excited to share on the Reverse Confetti Blog. Today I’m showing you how easy it is to use the great stamps and Confetti Cut dies to make a burlap frame for your home. Yep, I said home decor….don’t freak. It’s just like working on a card, but on a little larger space. To me, that means you get to add some extra little pretties to fill in the spaces. I started by covering a 6×6 canvas frame with burlap. It’s a NO sew project, just use a strong adhesive, like Scor-Tape to secure the burlap to the back of the frame. I start with a focal point. Today, I used the FABULOUS FLAMINGO stamp set for my inspiration. I just love the beautiful sentiments included in the set. I then began layering. I pulled out TAG ME, TOO, CIRCLES ‘ N SCALLOPS and the banner piece from TAG ME. I cut all my pieces, stamped the sentiment, and decided to add some black accent to the banner piece. The trendy diagonal stripe from SO STRIPEY was perfect for the job. Once I had my focal point complete, I moved outward from there adding bits and pieces of handmade embellies. It’s easy when you have such pretty Confetti Cut dies to work with. I die cut plenty of flowers with PETALS ‘N POSIES and two FABULOUS FLAMINGOS. I like to use papers from within the same paper pad, that way I know they will look great together. After I have all my pieces cut and stamped, I layered them up and place them on my frame where I think I want them. I take a step back and make sure I have a good balance of embellies. Then I adhere the pieces down and added the sequins. The last step was to add the ribbon to hang the frame. Home Decor items, don’t need to be hard. Stick to what you know and create something beautiful. The Confetti Crew is back with another fabulous dose of inspiration using this month’s color challenge. I love seeing each person’s take on the challenge! Have you played along? Just a few more days to enter your project for a chance to win a gift certificate to the Reverse Confetti store! I’ve added the link list to this post, too, so you don’t have to jump to another post to add your card. I can’t wait to see your creations! We have had several inquiries to when the FABULOUS FLAMINGO stamp set will be back in stock. While I do not have an exact date as of yet, I do want you to know that it has been re-ordered and we have requested that it ships to us as soon as possible. When our inventory is replenished, we will update our Facebook page and send out a newsletter. If you are not connected to either/both of those, please click the graphics with links below. I actually came up with this project idea while making the card that I shared yesterday. I am all about getting the most use/creativity from products, and I keep that in mind when designing stamps and Confetti Cuts dies. For today’s project I created a floral notecard set, but I did not use any floral stamps or Confetti Cuts. Can you tell what I used to create this flower and leaves? First, I cut 1 small scalloped circle from the CIRCLES ‘N SCALLOPS Confetti Cuts die set from yellow cardstock. Then, I cut 1 small circle from brown cardstock using the same die set and stamp with even lines from SO STRIPEY, attach to yellow scallop circle using dimensional adhesive. Of course, I had to add enamel dots for embellishment. The large leaf is cut from green cardstock using the lemon/lime die from the FRESH ‘N FRUITY Confetti Cuts die set. I stamped it with the large dots from WHOLE LOTTA DOTS and scored it down the center (for a more leafy look). The other leaf is the large leaf stamp and Confetti Cuts, also from FRESH ‘N FRUITY. Isn’t that a fun way to create a flower? The sentiment is from the LOTS TO SAY stamp set and is stamped on the rounded rectangle from the CLASS ACT Confetti Cuts die set, cut from kraft paper and mounted on the scalloped rectangle from LOVE NOTE Confetti Cuts die set. The entire panel is mounted to the white card base using dimensional adhesive.